A strong argument for the Midwestern city’s place as a hub for modernism as vibrant as Paris, Berlin, and New York. If the modernist movement was about smashing convention in poetry, prose, and visual art, then Olson (Director, Chicago Studies/Newberry Library; Modernism and the Ordinary, 2009) finds plenty of evidence that Chicago was, if not at the forefront, then a key player in the movement. It was home to Harriet Monroe, the founder of Poetry magazine, which was a launch pad for Ezra Pound, Marianne Moore, and T.S. Eliot. It hosted the 1913 Armory Show, bringing pioneering cubist works to a broad audience. Fanny Butcher, the influential book critic at the Chicago Tribune, encouraged her readers to take a chance on Ernest Hemingway and Gertrude Stein, who was a regular (if contentious) visitor to the city and stoked its small but vibrant culture of experimentalists. The city was also home to Richard Wright and Gwendolyn Brooks, innovative writers who helped define the black American experience before World War II. 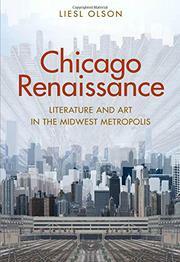 “Without Chicago,” writes Olson, “no consideration of the modernist movement is complete.” The city’s role may not be as towering as that of Bauhaus or the futurists—and the Armory Show and Stein weren’t homegrown—but Olson’s argument is still lively and persuasive, finding rich pockets of creativity throughout the city. Just as important, she reveals how modernism acquired a kind of populist vigor in Chicago: Monroe, for instance, was able to persuade meatpacking executives to help finance Poetry, and Butcher’s bully pulpit made tricky works accessible, if not always comprehensible, to a wider audience while influencing Hemingway's career. If Chicago wasn’t modernist central, it was the place where it became more than an elitist act, and though Olson approaches the subject with academic rigor, she writes with force, as well as originality, crafting fictionalized vignettes of her subjects’ experience of the city. A valuable, perspective-shifting work of both cultural and Midwestern history.